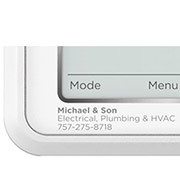 ​Product label programs let you customize Honeywell Home products with your company name so customers always know who to call for service and support. ​In the attached PowerPoint you will find step by step instruction on how to set up labels and parts in the Private Label Program. Download the instructions from here. Click below to get started on your private labels. ​Imprint your business name directly on residential equipment so customers know who to call for future HVAC service, support and upgrades.